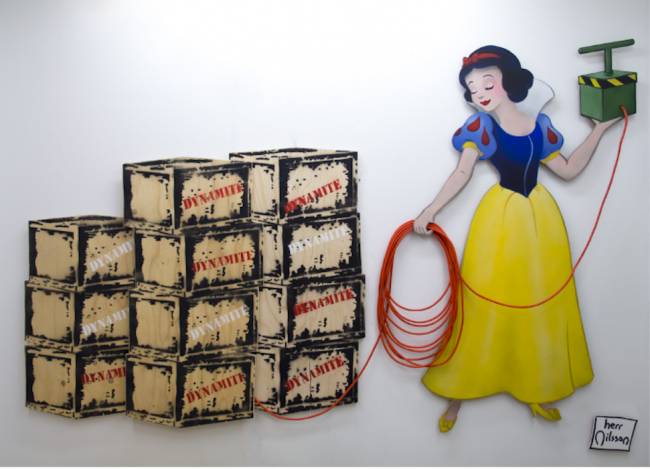 Swedish artist Herr Nilsson takes a satirical approach to widely recognized childhood characters including Snow White, Winnie the pooh, and Ronald McDonald. In the first show in our new Chelsea location, Nilsson presents what has been referred to as “sugar coated shock” by creating unimagined combinations and critiquing society through satire. His colorful display and choice of well loved characters doing seemingly ‘evil’ things remind viewers that evil can come from unexpected characters or associations. Herr Nilsson‘s, “Fill The World With Sunshine” artwork is based on a street art installation he did in Stockholm. The piece comes to life by incorporating actual figure shaped boards to resemble dynamite boxes. Snow white is pictured in her typical ensemble with an expression of carelessness, setting the tone for the show’s theme of juxtaposing good and bad. 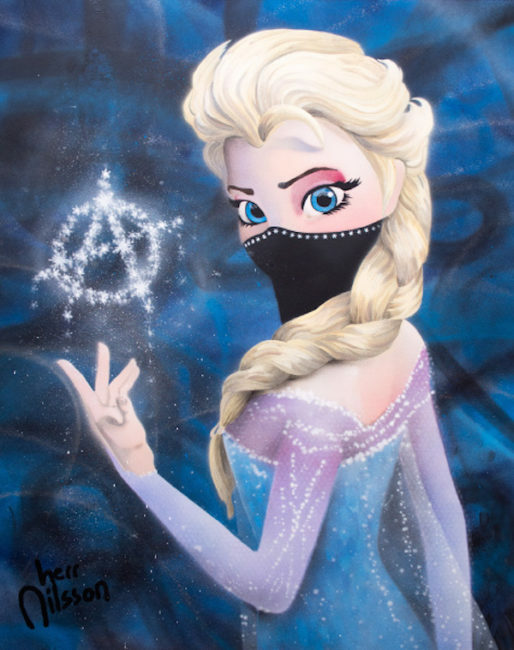 Nilsson takes that same idea of good and evil and implements it onto a widely loved disney character- Princess Elsa, titled “The Queen.” He keeps the same vibrancy and sparkle that she is associated with, but adds a mask and the symbol representing anarchy. Made of spray paint and glitter, the playful design reminds viewers that those in charge have more to them then what is on the outside. 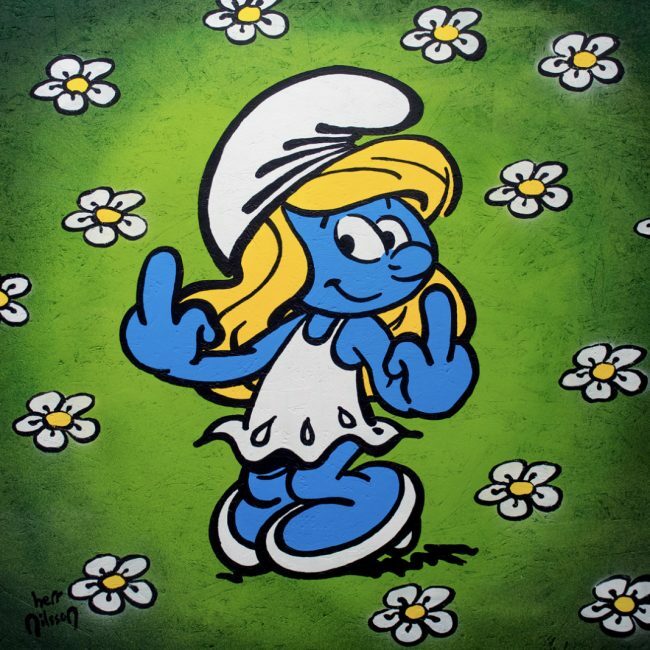 Next, Nilsson creates widely adored smurfette image, but adds the unlikely twist of the character sticking up her middle fingers. To capture the original image he created on a street building in Sweden, Nilsson used spray paint and a wood board to create his image. 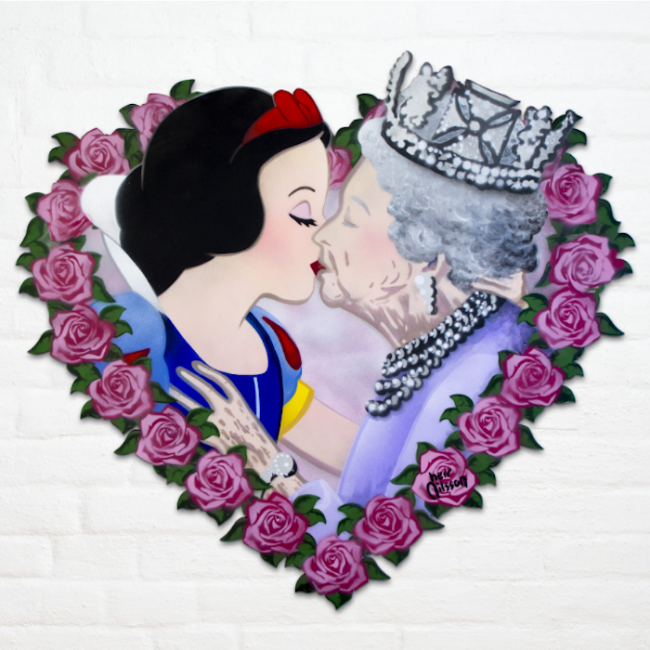 Nilsson creates works beyond fictional characters, which can be seen in his street art inspired creation of “The Kiss” featuring Queen Elizabeth and Snow White. He strategically first placed this image on a bustling street in London to push viewers to think with open minds. This work is created on a heart shaped board, surrounded with spray painted roses. The rose itself is a symbol of Nilsson’s key message. It is a beautiful thing- but is balanced by both a rose and a thorn- the good and the bad. 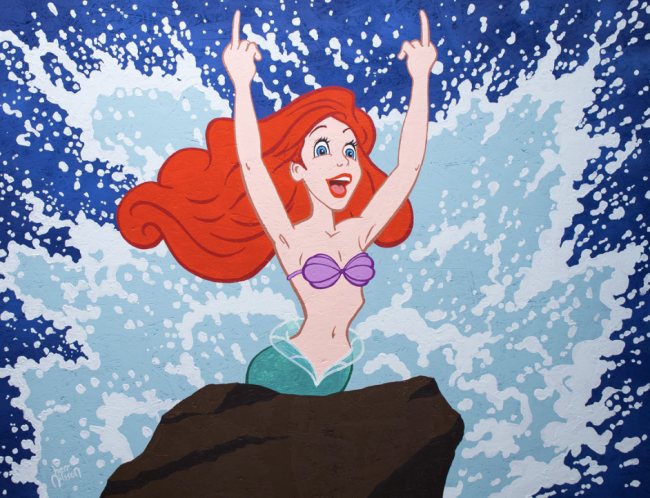 Continuing on the theme of acceptance and new concepts, Nilsson designs an image of Ariel the Mermaid, a non-human creature, rising from the sea and sticking up her middle fingers. The title, “Part of Your World” is named after a song in the film, in which Ariel sings about having it all, yet still ultimately just wanting to feel part of the human world. Here Nilsson continues his hope of acceptance to all kinds, as we are all ultimately part of one world. 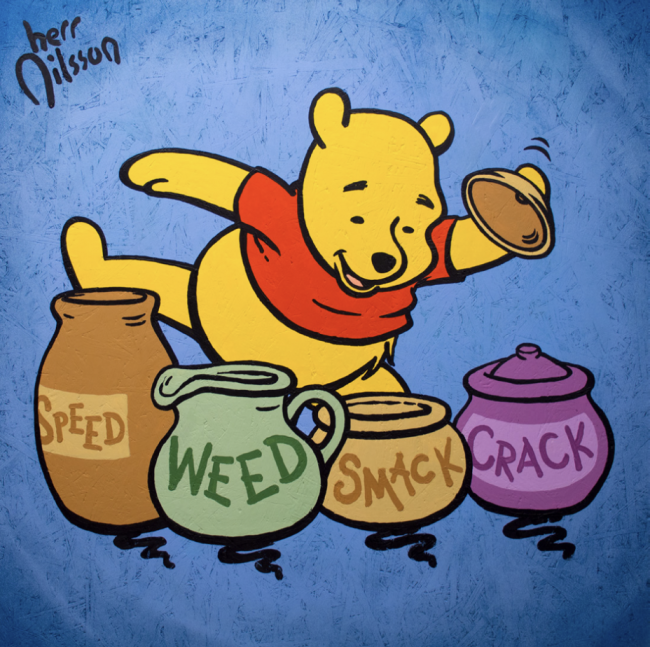 Nilsson touches on a lighter idea in his “Speed, weed, crack, smack” painting on coated wood board, commenting on the addictiveness some have to this drug similar to Winnie the pooh’s addiction to honey. He uses such an innocent character to match the innocence many associate with smoking. Nilsson also veers from the cartoon approach by creating imagery of the pope and Dalai lama, hinting that even those we worship have flaws. He pictures the Dalai Lama in a series of seven paintings, each with a unique color set, where he is sat for prayer, while simultaneously holding a cigarette and coke can in either hand. The show will be on view starting September 7th, with a collector’s preview at 6:00 pm, and general viewing from 7:00-10:00 pm. More artwork will be available at the show and on our website.